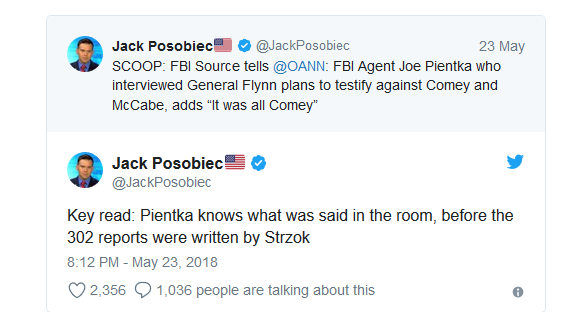 Yesterday The Conservative Tribune posted an article about an FBI agent who is willing to testify against James Comey regarding the FBI’s treatment of General Flynn. 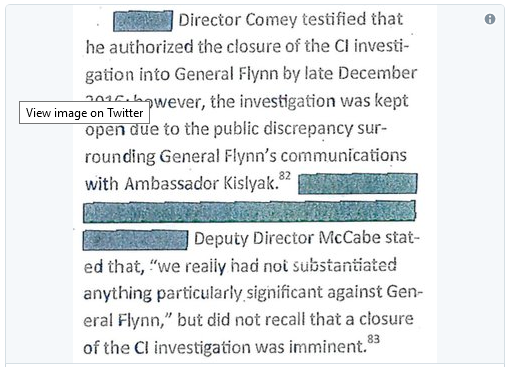 James Comey and Robert Mueller have been on a fishing expedition for a while. They are searching for someone who did something questionable at some point in their life so that they can convince that person to testify against President Trump. The eventual aim is the destruction of President Trump. The want him impeached, disgraced, and destroyed. They have totally lost their objectivity. It is ironic that their actions may be turning against them–not against their target. Oddly enough draining the swamp at the top levels of the FBI may actually be done by those in the lower levels of the FBI who respect the former integrity of the organization. This entry was posted in Uncategorized and tagged Conservative Tribune, FBI, General Flynn, James Comey, Mueller by granny g. Bookmark the permalink.